All models at different times from 2002 into 2003 suffered from understandable pressures to cut manufacturing costs and this is reflected in all models showing the removal of previous standard equipment, some of which was then transferred to the extra cost option lists, or simply deleted. One common deletion across the range has been one of the pair of horns which have for years given the cars a quality sound, although following protests from many quarters including ourselves, 2005 model year cars saw a reversal of the horn deletion. The ZT in particular suffered more from having a ‘single squeaker’ although this was a ‘low’ tone unit, than other MG models, simply from the fact of its small executive status. The 260 in particular shows this even more so and I often said to MG Rover people that they went to the trouble of giving these cars twinned exhausts each with twin tailpipes not because the car needed them, but for the image that they project, then the penny pinched with a single high pitched squeaker for a horn. A real contradiction that was accepted as being wrong and from car number 878 twin horns were fitted on the V8 models, although as car number 883 this doesn’t apply to many! My own car, #383, of course had only a single horn and has been a sore point, especially when using my son’s old 400 which has a superb sounding pair of horns. For a while I have been building the enthusiasm to fit a second horn, but the fact that the whole front of the car has to be removed to access the horn mounting position and wiring put off the job until the Christmas break when the car was not going to be used for a while. Because it is an issue that many owners have complained of the following resume of the work may well inspire others to follow suit. Removing the front is actually straight forward enough in terms of having to remove very many bolts and screws from the top and bottom edges and then some screws in the wheel arch areas. There being nine on the top edge, six on the bottom and four screws on each side. Earlier models are listed as only having two per side here. There are some clever plastic clips at the side join between the wing and the front bumper panel, which needs careful lifting and pulling of the bumper, with a helper, to disengage and this allows the panel to be slid forward. There are also neat location clips at the front edge of each wing to ensure accurate alignment between the bumper panel and the wing. Once the bumper panel is free there is the electrical plug connection under the left hand headlamp which covers lamps and ambient temp sensor. If the car has powered headlamp washers there is also the hose connection between the pump/reservoir and the front jets to consider. I found a degree of hose flexibility that allowed me to move the bumper panel away from the car enough to complete the job in hand without the need to disconnect the hose and plug it with the obvious spillage of washer fluid that would follow. I did however need to unplug the electrical connection. The other factor in my favour is that I have old carpeting in the garage and this allowed me to rest the bumper easily without the worry of scratching the paint. 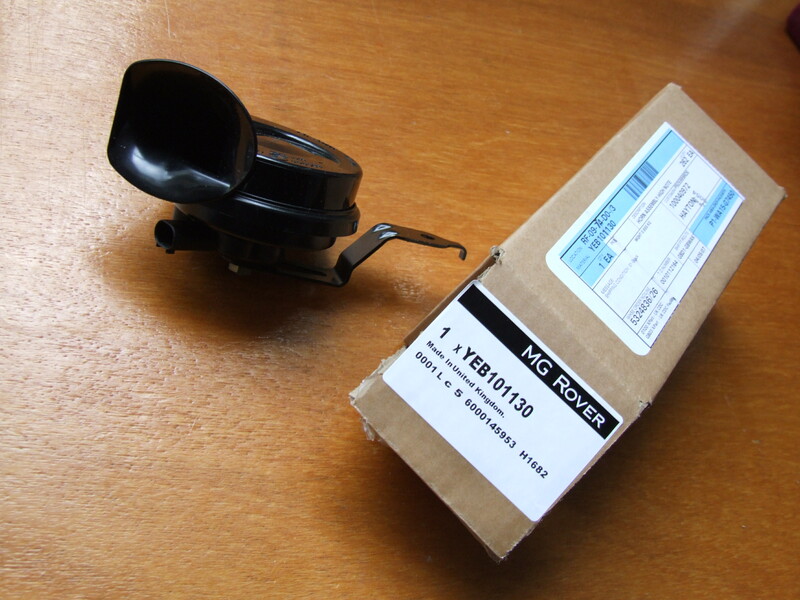 Anyway before committing to this course of action I had planned the work and already bought a new Fiamm high tone horn, MG Rover part number YEB 000160 priced at £10.12 plus vat. Fortunately I had access to a spare electrical connector as these are not off the shelf items, and the mounting bolt is hardly rocket science for a garage as full of parts as mine! My plan was to splice into the standard wiring with the new plug and section of wiring already connected to this and then simply plug in the additional horn and bolt everything back up. The only complication to this was the number of clips that have to be used to secure the wiring because of the very large air con/cooling fan fitted to these cars. The single low tome horn is mounted on the left side of the grille aperture with the right side being vacant. The link harness used for connecting the horn to the cars main loom also has additional wires for another unconnected function and this link harness has its main plug into the main harness on the right side of the car under and behind the headlamp. As the twin horn link harness simply follows the same route, splicing the existing wiring and adding the extra wiring spur for the additional horn was my preferred route. This involved identifying the horn wires, cutting back the insulation for around 10mm of the wires, without cutting the actual wire, identifying the feed and earth wire positions for the new plug and wiring and winding the bared ends of these wires around the appropriate exposed section of original wiring. The connections were then made permanent by soldering, then individually wrapped with insulation tape before the disturbed section was further wrapped in insulation tape. I would have used heat shrink has I been able to slide shrink tubing fully over the wiring. Nevertheless the job is no less effective than a standard join. If anyone following this route were unsure about breaking in to the original wiring then the replacement link harness is listed under part number YMQ 003100 for petrol models, and only £10.63 plus vat. I am unsure if the myriad of cable ties and clips required is supplied with this harnesses. I doubt it and so these would have to be bought separately. Testing preceded the refitting of the front end of the car, which in itself was a reversal of the removal procedure. However, as with most jobs a couple of additional jobs were undertaken whilst access was present. Firstly there is some interlocking foam insulation in the back of the bumper panel that is held in place by glorified Selotape that had become ineffective so I replaced it with some cloth backed gaffer tape. Also the sides of the headlamps were exposed so were cleaned and the remaining area wiped down as some dirt inevitably access this closed area. Overall this is quite a significant amount of work for such a small change, but definitely worth it, especially as my total cost was just over £12. If it were to be done professionally at garage rates then it would be quite expensive as I expect a minimum of three hours, probably four to be charged! Hello there. I found your blog by way of Google at the same time as looking for a comparable subject, your website got here up. It seems good. I’ve bookmarked it in my google bookmarks to come back later. Where did you get the horn from? Got it from Rimmers Tony but it was a few years ago. The reference on the box still applies. If you go to a breakers any car up to around year 03 should have both high and low tone horns.